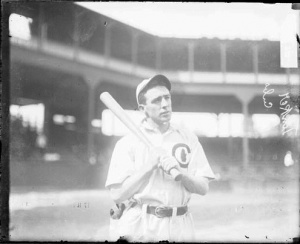 On June 28, 1910, Chicago Cubs shortstop Joe Tinker stole home plate twice, en route to an 11-1 victory over the Cincinnati Reds. 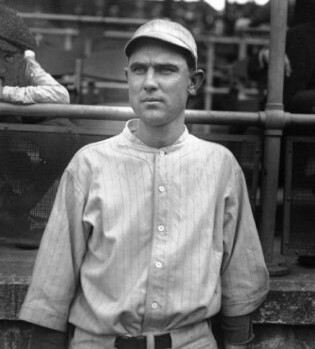 This made Tinker the first Major Leaguer to accomplish the feat, which has been accomplished less than a dozen times total in Major League history. Tinker went on to be elected into the Hall of Fame in 1946. Winning streaks can only last so long. Otherwise, they wouldn’t really be “streaks.” The Kansas City Royals recently saw the end of a ten-game winning streak that had temporarily catapulted them into first place in the AL Central. Going into last night’s game, I had a winning streak of my own, in which the Royals won each of the last four games I attended at Kauffman Stadium. That run also came to an end last night, as the Royals proved unable to provide any run support for Danny Duffy’s solid quality start. They lost 2-0 to the Los Angeles Dodgers. About the only consolation regarding the Royals’ hitting last night was that Clayton Kershaw did not manage to notch his second consecutive no-hitter. The Royals eked out six hits over the course of the game — scattered hits — no more than two in a single inning. We kept hoping for them to string something together, but the rally proved elusive last night. Attending a ballgame is never a bust of an evening, however. For the ceremonial first pitch last night, we got to witness this young fan reunite with his dad, who had spent the last year in the Middle East with the Air Force. It was also T-shirt Tuesday, and while they had run out of shirts by the time I got there (an hour early, even! ), the friend I met up with had arrived half-an-hour before I did. Not wanting to add yet another shirt to her wardrobe, she graciously allowed me to have hers. After the game, I picked up a few more abandoned souvenir cups to add to my ever-growing collection. By the time I walked out of the stadium, my hands were full. There’s more to attending a ballgame than just T-shirts and souvenirs, of course. Kauffman Stadium is one of my favorite places in the world to spend a few hours of my time. The atmosphere relaxes me, from the smell of unhealthy food and beer, to the lush green of the outfield grass, to the fountain display beyond the outfield fence, to just being surrounded by baseball. And really, it doesn’t even have to be Kauffman Stadium. Just being in close proximity to the dirt infield of a Little League diamond relaxes me. My favorite team just happens to reside at the K, and I feel lucky to be able to root for them in such a great stadium. Maybe tonight will be the start of another winning streak. In a game against the Washington Senators on June 23, 1917, Boston pitcher Babe Ruth angrily charged umpire Brick Owens after Owens called ball four for the first batter of the game. Ruth was ejected from the game, his teammates dragging him from the field. Ernie Shore came into the game in relief and proceeded to set down the next 26 hitters. The only hitter to get on base — Ruth’s walk — was caught trying to steal second.